Build the screen of your dreams. 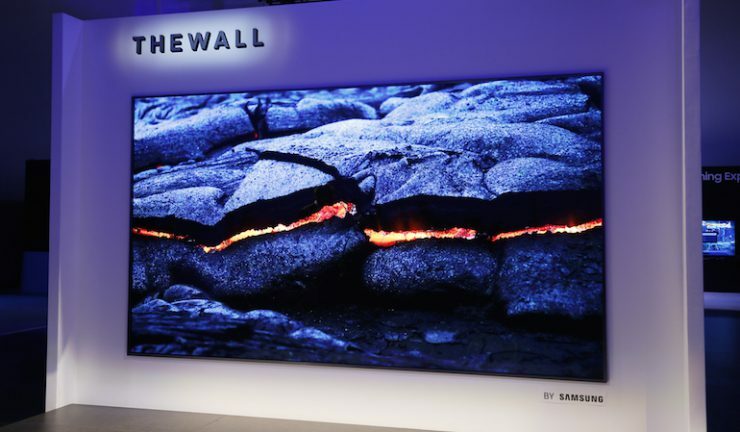 Samsung was host to more than 300 media and influencers at its First Look cocktail event in Las Vegas to kick off CES in Las Vegas and unveil the world’s first consumer modular MicroLED 146-inch TV, The Wall. Samsung says that The Wall has no restrictions to size, resolution or form, therefore consumers can choose how much space the TV will take in the home. It is a self-emitting display with micrometer (µm) scale LEDs that are much smaller than current LEDs, and serve as their own source of light. The MicroLED technology eliminates the need for colour filters or backlight, and in turn the TV will use less power and is likely to last longer. Samsung President of Visual Display, Jonghee Han and Samsung Electronics America Senior Vice President of Consumer Electronics, Dave Das addressed attendees and introduced the new TV display. “This modular TV can transform into any size. It is the ultimate screen with incredible brightness, colour gamut and volume,” Han said. “Samsung has always prioritised innovation and design. MicroLED, the ground-breaking technology used in The Wall, uses individual pixel LED chips that produce RGB colour, and because it is self-emitting, it produces darker blacks, brighter whites and the most realistic natural colours. MicroLED offers the benefits of existing technologies without any of the trade-offs,” Das said. Availability, pricing and specifications for Australia are yet to be confirmed. Appliance Retailer is attending CES as a guest of Samsung.